Michael Douglas and Catherine Zeta-Jones, George Clooney and Amal Alamuddin, Alec Baldwin and Hilaria Thomas — these are just some of the couples who are in an older man/younger woman relationship, which tends to get a bad rap for no real good reason. Michael and Catherine have been together for 15 years, and George and Amal are having twins, for Pete’s sake! If you’re a single mature man attracted to younger women, or you’re a single youthful woman drawn to men with a good number of years under their belt, EstablishedMen.com is usually part of the conversation. In this article, we’ll go into detail about everything the site has to offer — plus give you some others to think about while on your journey to a love that knows no bounds. 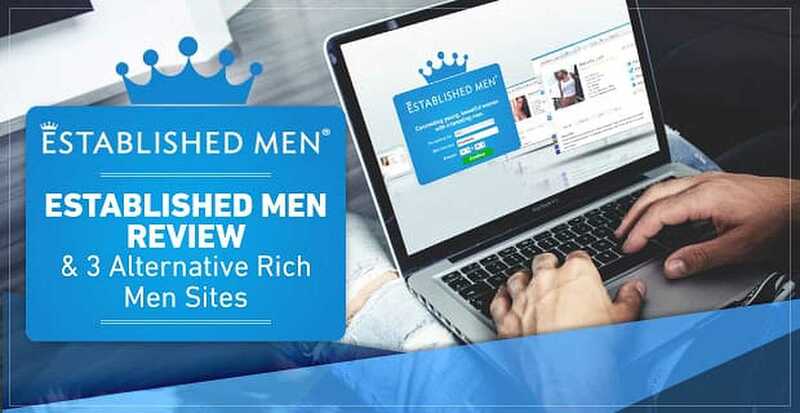 Established Men was created in 2008 and has become one of the most well-known dating websites for rich men and/or sugar daddies to find younger, attractive women and/or sugar babies — and vice versa. For these singles, it’s all about connecting with someone who also appreciates the finer things in life, and the site emphasizes that these are mutually-beneficial relationships. To get started, you’ll need to select the gender you’re looking for, the city you live near, and your preferred age range. Then you’ll have to input your email address, username, password, gender, birthday, height, body type, eye and hair color, ethnicity, and a greeting. Those are the only steps that are required, but if you’re serious about meeting someone special, we’d recommend adding some photos and filling out your About Me section. 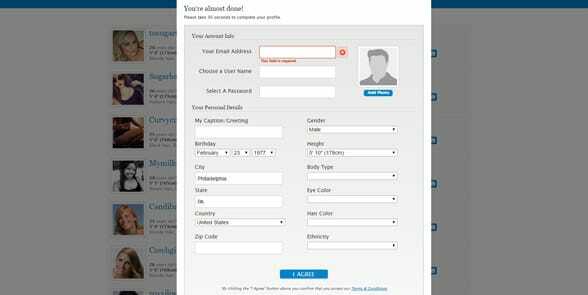 The layout is similar to a lot of other dating websites, with your dashboard at the top of the screen, profiles showing a person’s username, age, location, height, and hair and eye color, and everything neatly labeled. Signup on Established Men includes just a few pieces of information like your age, location, and gender. You also must choose a greeting to welcome members to your profile, so make it fun! Established Men says there are millions of singles on the site, but a good number of the profiles seem to be inactive or maybe even fake. So be careful when you’re vetting a match. You can search by the qualities we mentioned above as well as new members, choose the Find a Date Tonight feature, or send a flirt. Other services include private photo galleries, live chat, voice messaging, and the ability to hide your profile from search results if you met someone and want to take a break from seeing other people. Everything is absolutely free for women, and men can create a profile, browse, and send three messages without having to give their credit card information. However, if they want to communicate in other ways, highlight their profile with a special badge for premium members, and see new members before anyone else does for 24 hours, they’ll have to upgrade. Paid subscriptions are $79 for one month, $49 a month for three months, and $25 a month for 12 months. You’ll receive 100 credits, 300 credits, and 3,000 credits, respectively, which can be used for buying virtual gifts. Established Men has an interface similar to most dating sites, so it’s easy to navigate. 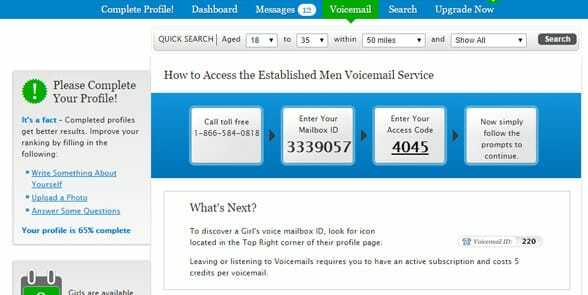 However, for men to access features, like voicemail [pictured], they’ll have to register for a paid subscription. In addition to being affordable, Established Men also makes safety a top priority. The team reviews every profile and either rejects it or approves it, which may take up to 24 hours, and they can be reached around the clock via email either through the contact form or [email protected] If you prefer snail mail, send your letters to: EM Media, Ruby Life Inc., PO Box 67027, Toronto, ON Canada, M4P 1E4 . Probably the most positive aspect of Established Men is the non-judgmental atmosphere. Men and women are free to express their desires without fear of someone calling them a perv or a golddigger. That’s what attracted Kyle, a divorced TV producer, and Melissa, a struggling actress, to the site. Established Men has a greater female-to-male gender ratio, but with millions of members, there’s sure to be someone for everyone. “It’s been tricky to pursue my passion because it can be feast or famine, and in the times when the work is slow, you know, you have to get another job and then that could cause you to miss auditions… and so it is nice to be able to have a partner… that understands where you are going and helps support that,” she told ABC News. “Like really, it’s a give-and-take with us, and I don’t really see what the problem is. I don’t see it as prostitution whatsoever,” he said. Kyle and Melissa were on their third date when they spoke with the news outlet and had already started planning a trip to Las Vegas together, having high hopes for their future. Our favorite rich men dating site is Match.com, mainly because it’s the most reputable and the most popular, having launched in 1995 and having led to more romantic connections than every other competitor. The site allows you to sort profiles by income and lifestyle habits, and, because there are 30 million members, you’re more likely to find someone you really click with. It’s in the name — EliteSingles is dedicated to elite singles who want to meet other elite singles. Not only are members more on the affluent side of the spectrum, but over 80% have a bachelor’s, master’s, or doctorate degree. In terms of age, the youngest tends to be around 30, while the oldest runs the gamut. In terms of location, members are located in more than 25 countries around the world, and 2,500 of them find love on the site every month. You could be next! Similar to Match and EliteSingles, eHarmony isn’t strictly a sugar daddy or rich men dating site, but it’s still a go-to in our opinion. Commitment-minded men and women of all ages flock to this site because of its exclusive 29 Dimensions® of Compatibility Matching Questionnaire. This test consists of 150 questions (answer as many or as few as you want) ranging from what your emotional energy and social style is to how you would describe your physicality and values. While the searching and matching is out of your hands, you can get very specific about your wants, including age. Catherine and Michael, as well as George and Amal, are prime examples that love truly comes in many forms. It doesn’t see age, race, gender, or any surface-level features. EstablishedMen.com has made a name for itself in this particular niche, and we think you’ll be pretty happy with it if you decide that’s the route you want to take. Just remember, if you’re a man, you’ll have to sign up for a paid membership to actually start a conversation. If that’s a deal-breaker, take a look at some of the alternatives we’ve given you.